The Athen.A (ex. 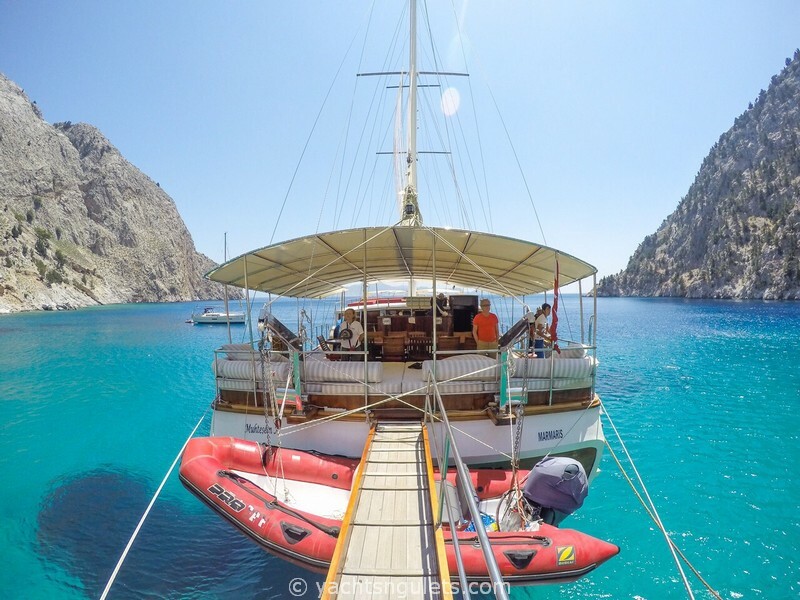 Muhtesem A) gulet accommodates up to 16 guests in Greece. The cabin arrangement with air conditioning comprises of 6 double cabins and 2 twin cabins - ideal for multi-family or mixed charter groups. Each cabin en-suite has an enclosed shower, wc, vanity, hairdryer, and shampoo and soap. Beginning from the moment you step on board you are greeted with enthusiasm and professionalism combined. The aft deck provides comfortable lounging cushions and a large size table with teak chairs for your alfresco dining experience. The galley prepares fresh foods, tasty dishes in an assortment of vegetable, fish, meat, poultry dishes - Mediterranean and Aegean style. Above the coach house is a great place to soak up the sun and relax on sun mats. The forward deck provides a second alfresco dining area as well as additional deck space for if you prefer to take your sun mat up front instead of above the coach. Guests can also enjoy the use of many water sports toys available on board. Captain Aytekin and his crew look forward to welcoming their guests!